The easiest way to learn a new task is to start with something you know and work your way up. 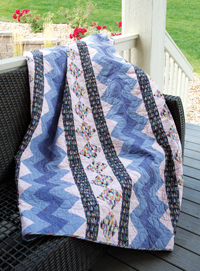 Jenny applies this concept to paper piecing and demonstrates how to make Zippity Doo Dah‘s square in a square block using foundation paper piecing. Learn this easy technique, which can be applied to all skill levels of blocks, and get perfect points at each intersection.